Is Swagbucks Legitimate or Another Scam? So you’ve heard the hype about how great Swagbucks is, but probably wonder if it is too good to be true. Before you join, you want to know… Is Swagbucks legit or another internet scam? The short answer is, yes, Swagbucks is legitimate but that’s not the right question to ask. The real question to ask is: “Is Swagbucks worth the effort?” Keep reading because there’s more you need to know before you join. Swagbucks is an online rewards system where users can earn virtual currency or cash-like rewards for every day web activity. I just checked their homepage and as of today (September 23, 2014) they claim to have paid over $73 million in rewards. There are a number of ways to earn rewards or “Swagbucks” like surfing the web, doing surveys, making online purchases, playing games, and a variety of other ways. There are a lot of various activities and each one has its own points assigned to it. Before you rush over there and join, keep reading because there’s more you need to know. Eventually you’ll earn enough points to cash in on some rewards but don’t quit your job in anticipation for that Swagbuck paycheck. Your points can be redeemed for prizes, gift cards, and Visa Reward Cards. When I look at my points, I estimate that each point is worth $0.01 (2,500 points will get you a $25 Visa Rewards Card, which comes out to 1 point = $0.01). Some of the other gift cards have a better Swagbuck exchange value, but also aren’t as readily converted into a cash value. Swagbucks is designed for virtually everyone who wants to earn rewards or make a little money from using the internet. You will earn rewards just for signing up (currently 30 points). You can earn points for things you already do online. Many different ways to claim rewards. The mobile site has limited features. It takes a long time to build points. The games aren’t that fun. I like the Google search function better. I made an Amazon purchase through SB to test the points system. The points were never credited to my account. It didn’t cost me more, but I didn’t get the points either. Earning points for searches is kind of random. One time I received 50 points but most of the time I don’t earn any. You won’t earn any real money doing this. I started this post with the question: is Swagbucks legit? I have answered that, but the real question is: Is Swagbucks worth the time and effort? Only you can make that decision, but for me the answer is… no. I don’t have the time to play games that I don’t enjoy, answer surveys for a few cents, do web searches that I may or may not get a penny or two for, or buy stuff through them when I may or may not actually get the points. If you search the web you will find people who talk about how great Swagbucks is. One review I read was from a man who was bragging about how he earned a $5 Amazon gift card every month. Earning $5 a month really isn’t worth the time to go through all those surveys and ads. I found other reviews where people claimed to earn more but it wasn’t for any decent money. There are a lot of positive reviews for SB all over the internet so you may be one of the people that really likes it. I haven’t heard of anyone making any serious money from it, but there may be a few. My personal experience is that if I were to calculate the time I spent on the site into an hourly wage, I wouldn’t even come close to making minimum wage. Though SB really isn’t for me, I still go on there every once in a while and browse and see if there a game that looks interesting or make a few points by browsing the web. If you haven’t joined then I say go ahead and try it out. There is no harm in trying since its free. If youre looking to make good money online then Swagbucks is not going to be any help. If you’re looking for a way to earn money online then I recommend that you try a different free program with Wealthy Affiliate. This is the #1 way for beginners to make money online. 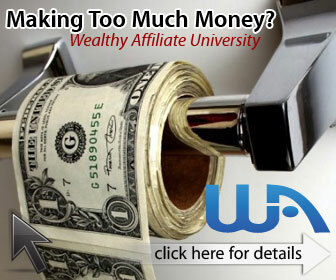 Check out my Wealthy Affiliate review or click here to go their homepage. If you have a different view of Swagbucks or you want to back me up go ahead and voice your opinion in the comments section. I’ll back you up. After reading the reviews here: http://reviewopedia.com/workathome/swagbucks-com-reviews-is-swag-bucks-legit-or-a-scam/, it looks to me like Swagbucks is so hard to earn money on that you’d do better working at McDonald’s. Even if they’re legitimate, they’re slow paying out, have terrible customer service, most surveys don’t give you credit, and once they decide you’ve earned enough, they cut you off. That’s the gist of the complaints. I use Bing to get airline miles, but I saw some complaints against them as well. We’ll see.I don’t think they’ll dump me once I earn a whole airline ticket because they haven’t dumped my sister who earns the maximum points every week in about 10 minutes/day of her free time. She’s faster than I am and earns decent money as a hair stylist, but she likes Bing as a paying hobby to earn airline miles and gift cards for Amazon or wherever. I’d like to say I only search during work hours for something related to editing, my paying job, but sometimes I get distracted and search because something interests me. Bottom line, if you use the internet to pass time only when you can’t earn money in a real job (internet jobs included: most of my business comes through my book blog) or help people (in person is better but some of my charity work is also internet based), it won’t do as much damage to your personal relationships and financial progress. As for affiliate marketing, I haven’t found anything that goes well with a kid lit blog that was worth my time either. Links to an Amazon store haven’t paid more than a few pennies in years. Neither did Bookbaby, so I lost interest. Maybe I’m missing something. Thanks for your input. I haven’t used Bing but I’ll have to check it out. I guess Swagbucks isn’t bad to use if you use it for things you normally do anyway. In affiliate marketing the most money I’ve made is by promoting information products or CPA offers. I’m just now starting to explore digital product creation but I’m only in the early stages of that.